“We hold these truths to be self-evident” — well maybe in the case of the US Declaration of Independence, but not necessarily in the case of what it takes to start, build and scale-up companies to reach critical mass. Why is it that in most cases, entrepreneurs who start companies rarely make the transformation into being the CEOs that grow the enterprises to critical mass? Or that so many start-ups fail, after tremendous initial growth and promise? 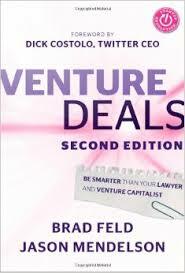 After going through several tours of duty as an entrepreneur and business founder, before morphing into CEO and Chairman roles in growing, complex venture-backed enterprises, and then finally joining the “dark side” by becoming a venture investor myself , it has become clear to me that it takes very different competencies and guiding principles to succeed at each stage. What is “common sense and self-evident” at each stage, could be “poison” to the next (and vice versa). 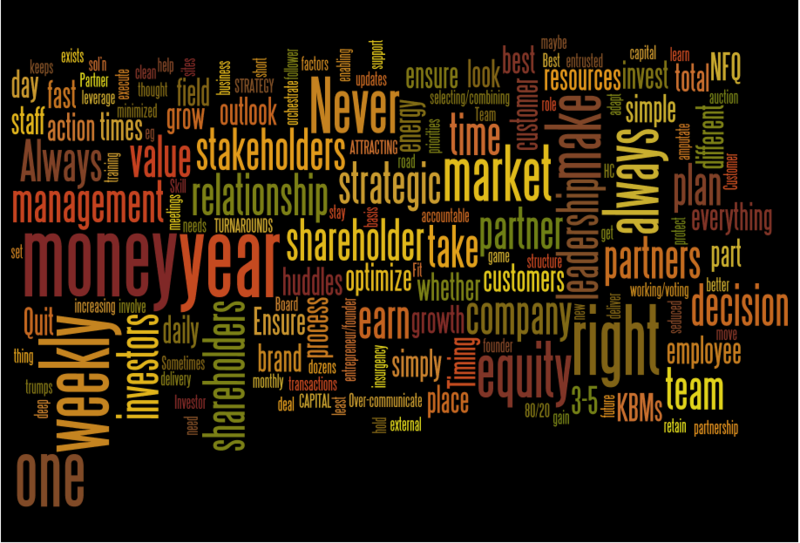 These transition points represent significant risk for shareholders (including the original founder) of the company, unless there is a strong commitment from leadership to make the necessary adjustments and changes, so that the organization is enabled and empowered to realize on its potential at all times. As a little New Year’s gift to my fellow business innovators and entrepreneurs, I have summarized some of the observations and guiding principles that I have found useful in my own personal journey. 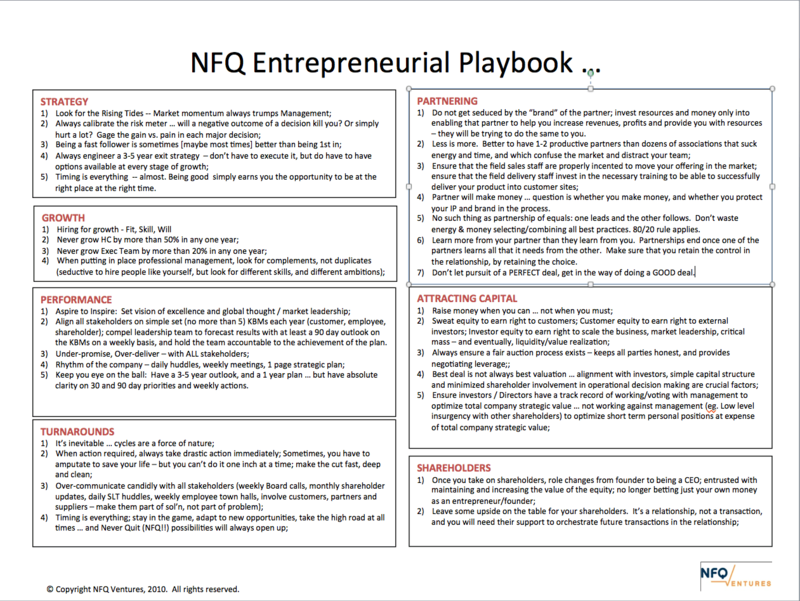 While it is impossible to capture all of these experiences in one big blog post, I thought that I would start by posting a one page outline of the major topics in the NFQ Entrepeneurial Fieldbook, and invite comment and discussion. Depending on the level of interest, and time permitting, I would be happy to elaborate with experiences and more detailed thoughts on any of the topics that are outlined here, in future blog posts. Enjoy, have a great 2011 and rest of this new decade, and use these in good health !! !